My wife gave me a Kindle for our anniversary this past summer. The short review is that I like the technology a lot, but since I’m not interested in much new fiction outside of Cormac McCarthy and William Gay, my use of the Kindle will depend largely on how many older books are released in the Kindle format. I was pleasantly surprised to find quite a few vintage science fiction books in the Kindle store, many of them priced at just a dollar or two. For example, I found some Andre Norton books. Her Star Man’s Son, retitled Daybreak 2250 AD, was the first science fiction book I read, and is still one of my favorites. I also found several books by one of the founders of the science fiction genre, Edmond Hamilton. I read a few of his books on the Kindle, and then bought several more on eBay and read them. In the first of a new series of posts, I’ll briefly review some of these books. Other books by other authors will follow. My vintage science fiction interest lies generally in books from the fifties through the seventies. There may be a few outside that range, but they will be the exception, not the rule. 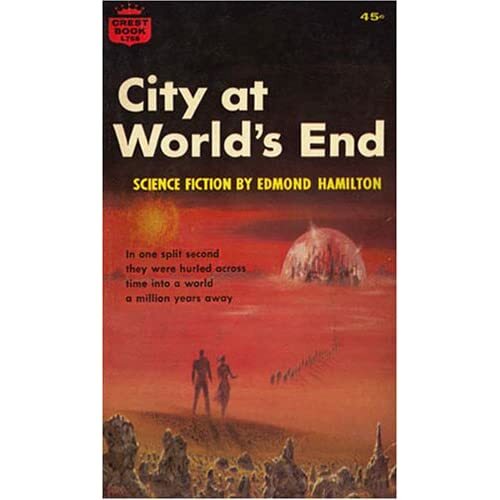 The first Edmond Hamilton book I read was City at World’s End (1950), a book about a city that is blown far into the future by an atomic bomb. It’s a good read. I enjoyed the story. The character development was good, certainly by pulp sci-fi standards. The book is the equivalent of a Saturday afternoon B-Movie on AMC or Turner Classics. Not one of my favorites, but worth a read. Things got significantly more interesting with the next book: The Star Kings (1947). This one is about a man named John Gordon, who is mentally contacted by a man from the far future and, out of boredom, agrees to a mind transfer. Gordon finds himself in the far future, in the body of a prince and in the middle of a galactic war. It is a great read. I liked it so much I bought the sequel, Return to the Stars (1970, 23 years later), on eBay. The sequel is interesting, but not nearly as good as the first book. Highly recommended. Next, I read The Three Planeteers, accurately described on Amazon as the “science fiction pulp classic.” It’s a short but interesting space opera about three outlaws who are called upon to save the galaxy from the evil League of Cold Worlds. The writing is similar to The Star Kings, and it is my second favorite of the Hamilton books I have read so far. It’s a good book in 2008. When you consider it was written in 1940, it’s even more amazing. I also read A Yank at Valhalla (1950), an odd book about a guy on an Arctic expedition who winds up in the middle of Norse mythology. I didn’t like it at all at first, but by the time I finished, I thought it was worth a read. Lastly, I read The Haunted Stars (1960) (boring, and my least favorite) and The Star of Life (1959) (not great, but worth a read). There are lots of other Edmond Hamilton books out there, but they are not easy to find. I continue to monitor eBay and will buy others as the opportunity arises. Hamilton takes his place as my second favorite vintage sci-fi writer (behind Andre Norton), for now. As always, I encourage other book recommendations via the Comments. Next time: a vintage Arthur C. Clarke book that bored me to tears. Posted on December 18, 2008 by KentPosted in LifeTagged books, scifi.